For this Big LEDs assignment we were put in groups of three and given instructions to use the leDMX4 pro, Meanwell power supply, and madmapper to drive a roll of LED tape in whatever configuration we wanted. Kemi, Adrian, and I worked together to complete this. We decided to arrange the LED strip into a bowl and diffuse it with an interesting material to see what type of effect we would get. We ran into a few different issues when doing the initial setup of the dmx controller and connecting it to madmapper. The overall issue was getting it to connect to the computer’s network. After trying a few different dongles and converters we were able to get it to work using an ethernet to thunderbolt adapter. The rest of the process was fairly easy and straightforward. Overall I felt like this assignment gave me a good intro to DMX and its’ versatility in controlling lighting elements. For the final LIPP show Anna and I will be working together to create a performance that takes on the idea of digitization of humanity and how this could look in an alternative and or futuristic universe. Techniques covered for the performance will range from GL, face meshes, pre recorded and live microscope feeds, and audio manipulation. The concept is a combination of concepts ranging from organic matter taking on and metamorphosing it into a digital presence to artificial intelligence and how these systems are becoming increasingly humanlike. Below are a few examples of visual styles we are going to try to incorporate into the piece. 1. Morgan and Anna both at table in middle. 2. Computer Voice: “Baseline test has now begun” (something similar signifying test on organic life has taken place). 3. Morgan taking samples from both himself and Anna. Anna helping hand him petri dishes, etc. 4. Max visuals of organic life in petri dishes on projector. 1. Start of distortion in cells (shown through visuals on screen). 2. Computer Voice: “Anomaly Detected”. 3. Cell distortion continues & increases. 4. Narrative Baseline test of repeating words, answering questions between Morgan and Anna with both of them saying different answers. Audience is unsure of which one is the anomaly (or which answer is the right one to the test). 1. Computer says one of them did not pass test (reword later). 2. Computer Voice: “Warning, infected subject is highly contagious”. 3. Fade out of microscope (cell) visuals. 4. Anna and Morgan’s face side by side on each screen. No distortions yet. 5. Anna and Morgan’s face both start to distort (openGL face mesh, and other manipulation techniques). 1. Anna and Morgan's Face start to merge together and distort into one abstract entity. 2. Abstract form/shapes show up on the screen (shaders). 3. Computer Voice: saying something about test being resolved. (the abnormal/non human won). The midterm performance for LIPP took place a few weeks back. All of the performances were amazing. Each groups brought unique dynamics and processes to their performance. Olivia, Topher, and I were quite happy with the way our’s turned out in the end. It was fun seeing what the piece turned into when compared to the original performance proposal. The Final form of the piece included Olivia doing visuals and background music manipulation, Topher using an overhead camera to frame and add extra imagery to the scene as well as make ridiculous noises to add to the ambiance. Finally I acted out the scenes using a variety of puppets and figurines while wearing a go pro attached to my forehead. Of course there were aspects of the performance that we would change given the time or ability to perform it again but overall we were all very pleased. For this assignment I decided to analyze the functions and qualities of light of the kinetic audio visual installation and performance: Deep Web, by the design studio, WhiteVoid. The composition of the installation can be broken down to a few different structures. The main two being the large led bulb system hanging above the viewers. This system moves in various synchronous patterns while being pointed to by the second structure. The second being laser arrays on the side of the room which direct their beams at the led bulbs and change color and direction reactively to the score. 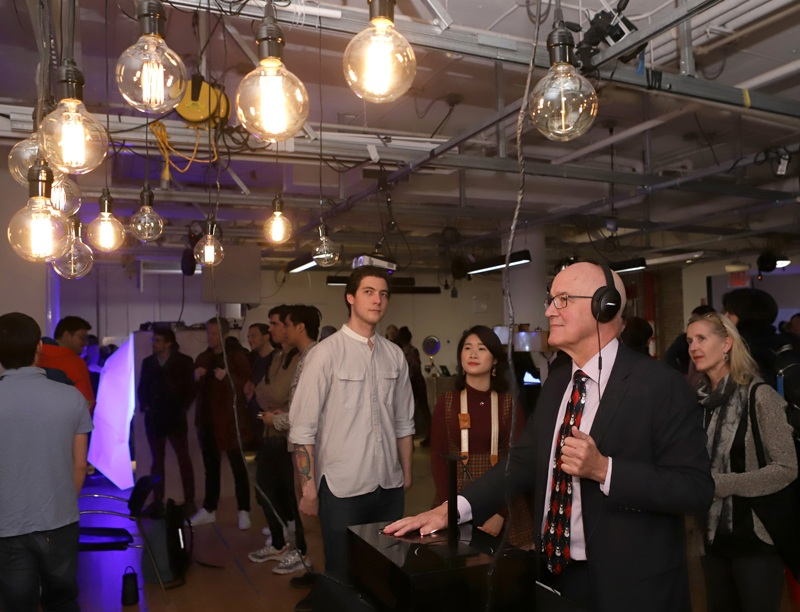 As the installation is hanging above the crowd it allows for unique perspectives of viewing from different locations throughout the large venue. I imagine being underneath the piece while it is moving and focusing on the bulbs to be hypnotizing in its’ own way and if you move the the edge of the piece there is an entirely different perspective achieved from the piece. Deep Web is modeled in a way that seems as thought it would make sense to be immediately below it but then really moving around and seeing other perspectives of the piece allow the viewer to have a fuller view and appreciation of it. The audiences attention is focused above them the entire time. With it constantly being redirected from the moving led array to the lasers flashing and moving. I can imagine this having the added effect of allowing people to fully immerse themselves in the piece easier than if they were looking horizontally in front of them. For me the mood of the piece from the light’s perspective has to do with the narrative of the piece. It begins in a very minimalistic way and then progresses into more extravagant displays over the course of the performance. From this the mood is able to change in intensity and lightness. Adding the audio element into the piece adds to the overall mood and atmosphere of the piece. Last week was our first performance for Live Image Processing. When I was thinking about the piece I wanted to perform I wasn’t really sure what direction I wanted to go in. For previous assignments I had made things that were visually interesting to me but not really meaningful. After talking with Matt about my concerns with the performance he gave me some good advice about experimenting and that it didn’t necessarily have to be meaningful. I began to experiment with a few different concepts. The first using stock political footage and voiceover from various politicians. This idea didn’t really take me anywhere interesting so i decided to switch to using old home video footage. This idea eventually led me to finding footage of cells splitting under a microscope. From here I started working on a piece that began as a very organic process happening and then over time begin to take the form of something extremely inorganic and geometric. Overall I was pretty happy with how the piece turned out given the short performance window. I enjoyed the element of performing the piece and it made me more excited for the next two performances. Below is a test run through of the piece. It varies from the final performance but it follows most of the same timing and structure. And some screenshots of the patch and presentation. The patch was broken into four different sections and then I crossfaded between each section except for one. For this assignment we were tasked with choosing a topic to design and build a critical object about. Teams were also given sets of requirements for the created piece. The piece Gilad and I made was required to use an organic element, convey surrealism, and emote anxiety. After a lot of brainstorming we decided to work around the topic of systemic bias, more specifically that of predictive policing and their use of artificial intelligence. This piece from propublica was eye opening to us and helped to shape the framework of the awareness machine we created. We wanted to have the final design of the piece be minimalistic and have an overall sterile look to it. The thinking behind this being that an association with this look and systems of various kinds would occur. The technology behind the piece was fairly simple. Using a Finite State Machine built in arduino code we were able to asynchronously control a high torque servo and then use a powerswitch tail to control the blender. Everything was controlled using Arduino. Some pieces were laser cut to help add to the design. A final video of the working piece can be found below. The final project for Connected Devices was to create an IOT thermostat that would record the temperature in whatever room it was placed in and then send that temperature to a remote server. The thermostat was required to have a working UI and post the temperature to the server once every hour for a week straight. After a lot of trial and error I was able to achieve this using the MKR 1010 microcontroller, much assistance from Tom Igoe, and Koji, and a few repos listed below. The initial setup of the MKR1010 took quite a while. Having to make sure that the most up to date firmware was present on the device, adding the mac address to itpsandbox, and then receiving a static ip address for the device. Once all of this was done and I was assigned a specific session key I could begin really working. I made the decision to use dweet to test that I was sending data correctly. First I wanted to test the server with a static value and once that sent properly I set up the temperature reading circuit and sent the temperature data to dweet. Both of those worked correctly so I moved onto the real thing. This is the part of the assignment where I wish I could say everything worked perfectly the first try but I ended up spending more time than I care to admit trying to fix an error that made little sense to me. Multiple people attempted to help and it wasn’t until Tom took a look at my code and realized that in my call to the server address I had added “https://” this created a -2 HTTP Status in my code even when everything looked like it was sending to the server properly. Once this issue was fixed I got my first 400 Status, this wasn’t ideal but I was still elated because at least I knew that it was because of a JSON formatting error rather than some unknown. After a lot of tweaking to the JSON I was sending I finally got a 201 status. Curling to the server proved that I was successful and could focus on doing a bit of fine tuning and working on the UI. I decided not to invest as much time in that aspect so I stuck to a simple LCD screen and potentiometer combination. The LCD displays the current room temperature in Celsius and the potentiometer simply turns the temperature display on or off depending on the state of rotation. This week I wanted to get deeper into using newer objects and seeing if I could work to create glitchy distortion effects. At this point I want to try to push myself to understand why certain effects and objects create such alarming visuals to try to work backwards so that I can subtly bring in these types of visuals in a less immediately jarring way during my performances. At this point, I think the things I am struggling with the most is keeping track of why objects are having certain effects when I implement them farther down the patch. For example, the more complex my patch has become the less I understand why adding a certain effect, that I think should cause a video to be manipulated in one way, causes something unexpected and confusing. That along with just keeping track of the data in a way that I can remember how to make sure I’m not missing planes etc. These seem like they will take time so I’m just enjoying the learning process. For my performance I’ve been thinking about the phrase "I am” and how it relates to the way I have been feeling since starting ITP. The way I have defined myself or just thought about who I am over the past few years seems to be changing constantly and over the past few months even more so. I’m not sure how I would convey that through the performance or even if it would be right for the performance but it’s something I’ve been thinking about. I also like the idea of just manipulating a bunch of videos/photo headshots I’ve taken of people. My patch was broken up into three main parts. The middle and right parts was a modified version of what I had done last week. Modified by adding in msp signals and cleaning up a few of the less optimized areas. The leftmost section was new. The idea was to make a sort of jumpy glitch effect that I could overlay between recorded video and screen caps of myself. I found a page online that showed how to make a nice glitch effect but I honestly didn’t understand most of what was going on so I broke it down and spend some time figuring it out piece by piece. I’m still not totally sure what is happening in it but I figured out enough to make my own frankenstein version. Finally I took all the patches and made a presentation mode overlay so I could work with them and blend them. The Assignment for this week was to begin building a video playback system. My goals were to get more comfortable with a lot of the objects and processes that we had gone over in class but also to try experimenting and seeing what else was possible. Most of the issues I had were that I’m still not totally sure how a lot of objects work, such as chromakey and xfade, so understanding why the output acts the way it does is a bit difficult. I find the visual programming to be quite intuitive and fun though. The major issue I had was that, even using window instead of pwindow, when I loaded in videos to the program the framerate dropped significantly and there was a lot of lag. This is why I used live webcam footage for my documentation. The patch that I created is broken up to four different parts. The first part of the patch is really responsible for unpacking the video’s values and then sending the rgb out to the second portion. Once they return from part they are repacked and sent into a gswitch for toggling between color and b&w. the second portion of the patch manipulates the zoom levels and anchor points of the first live video before sending it back. For this portion, Matt Romein’s sample patches from week 2 were used. Part 3 uses chromakey and rota to manipulate a second video feed. Finally the fourth part used xfade to fade the two videos together as the user would like. This week’s assignment was to create a web interface for an existing web-connected consumer device. In class we specifically went over the hue bulb system and that is the device I created the web interface for. I began the assignment by going over the documentation provided to us regarding the hue system, assigned IP, and clip api. After getting my login credentials from the clip API I began doing basic calls of the hue bulb. i.e turning it on and off and changing the colors manually. After playing around with this system for a bit I began to focus my attention on creating my own interface. I referenced the hue control repo from Tom Igoe, and node hue api repo from Peter Murray. I had difficulty understanding portions of getting the api to work so it took a good amount of time to really wrap my head around what was happening. Timothy Lobiak was also extremely helpful in giving me guidance and sharing code snippets on how to create the colorMode sliders and storing values. I ended up deciding to use p5.js due to my familiarity with the DOM elements. Even with this I was a bit rusty so with the language. My goal for functionality was to be able to turn the light on and off with a button, then have three sliders that controlled the hue, saturation, and brightness and have the bulb change state in real time depending on the position of each slider. this is the basic interface functioning. this assignment helped me to understand the workings of these devices and their APIs. It also challenged me to think about ways these devices and processes can be used for other applications I might have in mind for projects. Of all the galleries visited this week, Paul Stephen Benjamin’s Pure, Very, New struck me the most. More specifically the portraits that he shot of people and then printed on an extremely black paper. At first glance the photos look like a textured paper but upon further inspection you begin to notice the shapes of the subject. As I approached the pieces I was able to see how detailed the subjects were. From the textures of their skin to the detail of their facial expressions. It took me a few minutes to take in the pieces and it really made me question the process he went through to obtain the pieces. It really took me being there in person to be able to appreciate those pieces. Something about them is lost without seeing them in that form. I felt that way with a majority of this exhibition though. The mixture of black lights, single channel tvs, and less technological art gave it a flow that I found hard to describe. I found myself comparing this exhibit to the Borders exhibit at the James Cohan Gallery. Something about the contrast between seeing artworks dealing with violence, humanity, and social issues and then comparing them to those black large scale paintings, which made me think of black holes, gave off a feeling of endless trouble and problems for society. For Critical Objects assignment 2 we were required to create a disobedient object. Meaning an object that serves as a form of social or political protest. The focus for this project was focused more on the critical critique and technology elements. When thinking about a subject to create a disobedient piece towards I tried to think locally and more specifically towards something that directly impacts me. For all of the things I love about NYC there are plenty of things I can’t stand about it. After living here for three years my tolerance for the MTA has decreased exponentially. This being so, Adi and I decided to create an object that would be a disruption to the MTA. We wanted the piece to only be noticeable and cause a disturbance when trains do not run on schedule Out of this came the MTA Service Disruptor. The idea behind the device is that someone protesting the MTA would take the piece and plant it secure location facing the train tracks. The device would then be silent as long as trains were running on the correct schedule. As soon as the trains began to run off schedule then the device would start making an irritating beep sound. The longer the time until the next train the louder and more obnoxious until the trains return to their normal schedule. The concept is that the Service Disruptor will force people to begin to discuss whats going on and then keep the issue relevant for as long as necessary. The goal of the piece is not to solve the issues with the NYC subway system but to keep the topic relevant and make New Yorkers more hostile towards the heads of the MTA. The Service Disruptor uses a basic circuit comprised of an ultrasonic sensor, basic speaker and small arduino microcontroller. The small form factor and simplicity of the piece makes it ideal for creating many of them and planting all over the city at different stations. For the first assignment we had to record 5-10 minutes of short video clips to use as a sample bank. Factors for us to think about were less about narrative and theme and more about visual elements like Light, Color, and Shape. I come from a film photography background and in that type of work I usually try to think think about the visuals of an image I’m composing as well as theme and developing a narrative. Thinking in a different context proved challenging but interesting. The videos I ended up taking were mostly clips from walking around my neighborhood in Bushwick, to work in Manhattan, and to and from ITP. During these walks I tried to pay attention to light, texture, and juxtaposition, both within the single video and between other clips I had taken. I tried to vary the clips in terms of scale of focus once I found a rhythm with the video taking process. The first assignment for Connected Devices required us to make a basic server using Node.JS and Express. For the server i drew heavily on example code used in class last Tuesday and also used Tom Igoe’s Four Line Server example. Finally the Express.JS routing guide was extremely helpful. For my server I decided to make a basic remote thermostat that would let a user control the temperature in their apartment as well as see/change the state of the thermostat. i.e whether it is in heat/cold/off state. My biggest issues with completing the assignment came from my lack of experience with html and getting a better interface/more functionality out of the server. For Example I would like the user to be able to be prompted to manually set the temperature if they like. As I learn more about Node.js/Express and interfacing I know these types of issues will subside. temperature sets a random temperature value to the output when the state is changed. When thinking about this first assignment and all of the possibilities for creating a critical object it was easy to get overwhelmed with subject matter. This is why Dana and I decided to create a piece that would be light hearted but still make people think. Our ideation really began when we started talking about standardization of things and process that have seemingly just been accepted by people over the years. 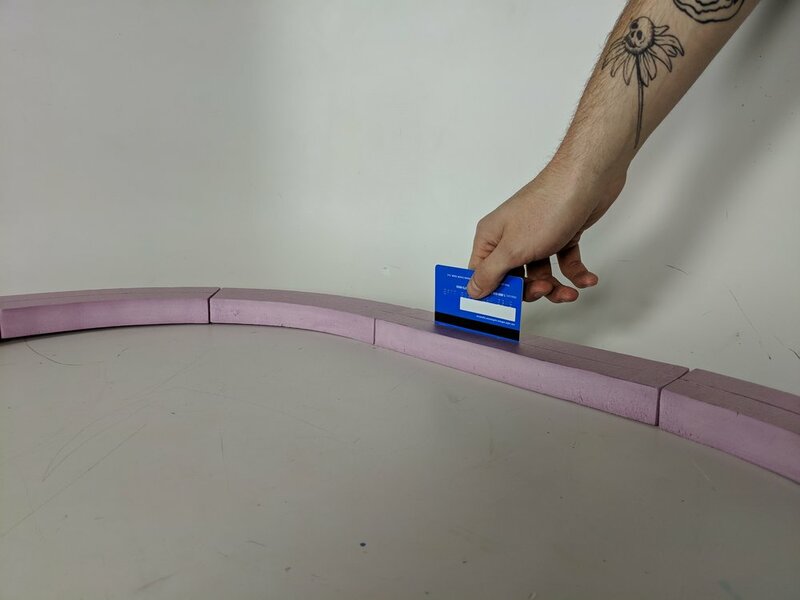 After talking about that concept for a bit we started talking about credit cards and how they add a level of separation between the feelings of spending money, which is a serious action, and the feeling of playing, either by swiping, inserting, or tapping a card. 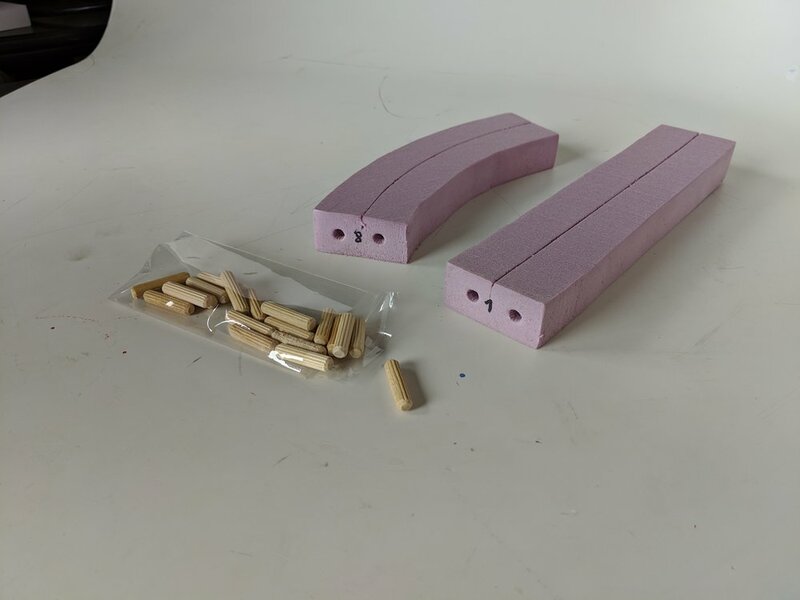 From this idea we began to develop a game modeled after wooden train sets. 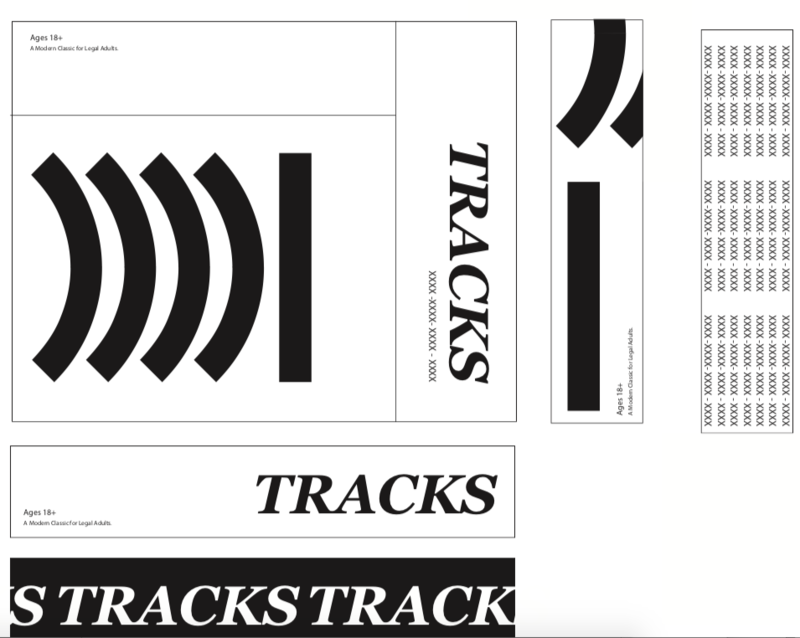 The game we developed is titled TRACKS. The theme of the game is that the player opens up a box that looks like it contains a normal game, when they open the box they are initially presented with a credit card and a manual for playing the game. 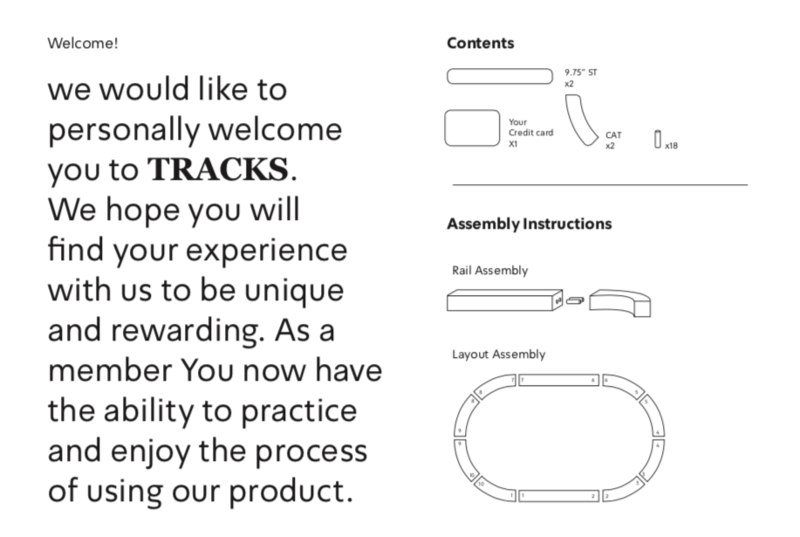 After that they can begin assembling the tracks and use the credit card to play with them. The design took heavily from minimalist packaging design and old VHS cases. We wanted the packaging and information given in the box to really highlight that this was a game, supposedly designed by a large company. We also wanted the game to be ambiguous to its intentions until the player really reads the information provided and starts to assemble the pieces of track. 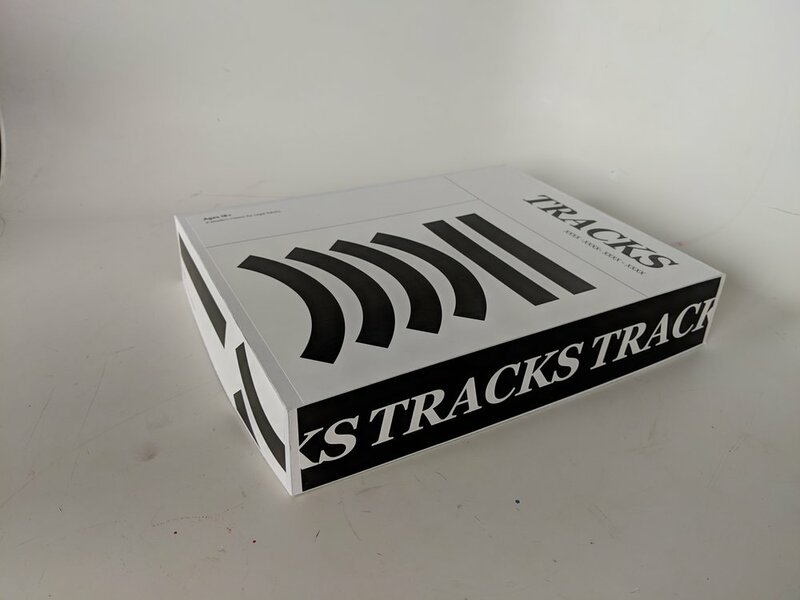 The actual building of the tracks and the box were more difficult than we had expected. 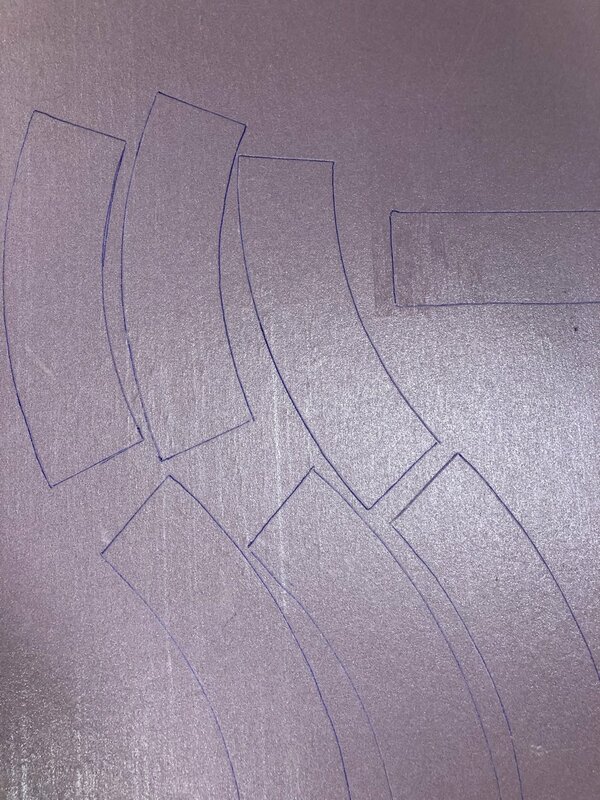 Without access to ITP’s laser we were forced to hand carve each piece of track for the credit card to slide in. Also creating the box proved challenging as we chose the wrong thickness of cardboard at first which gave us issues with bending. 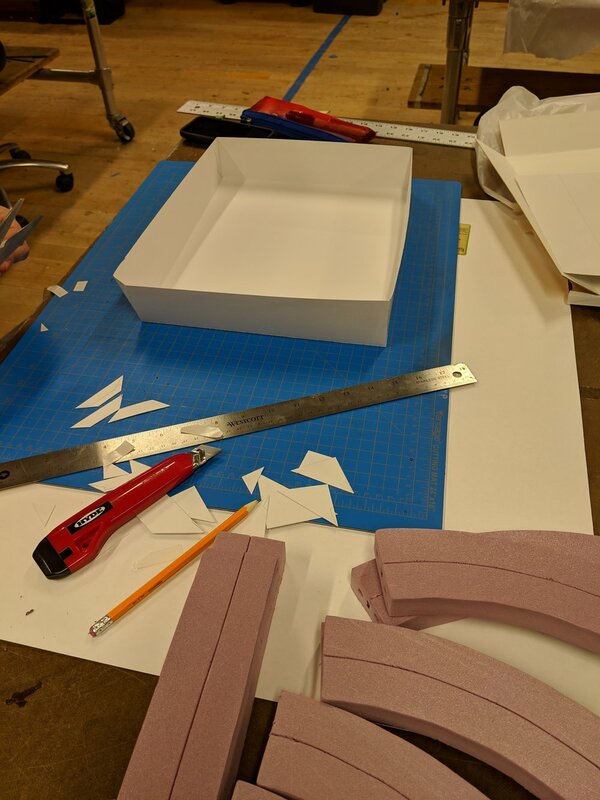 Final materials ended up being hard foam pieces, dowels, cardboard, and paper mixes. 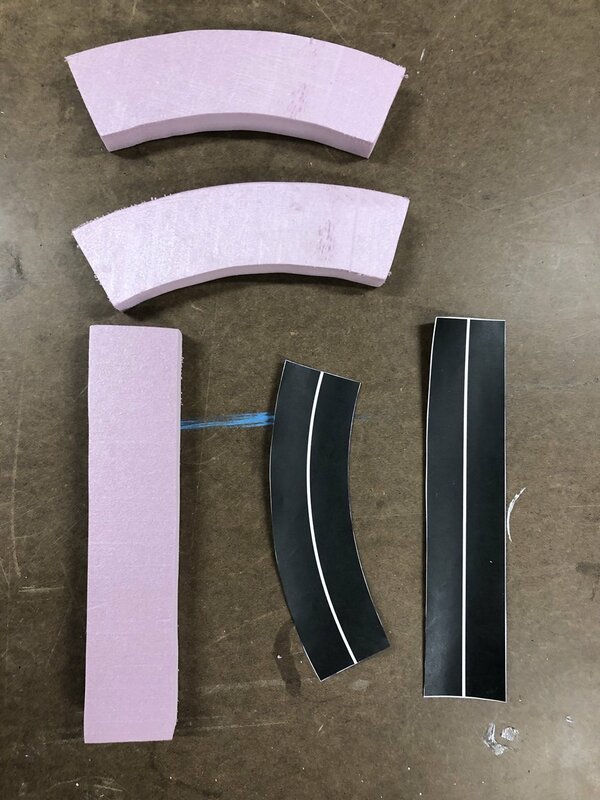 Below are some photos of the building process. Overall, I feel that the execution of the piece went very well considering the limitations imposed with time and tools. 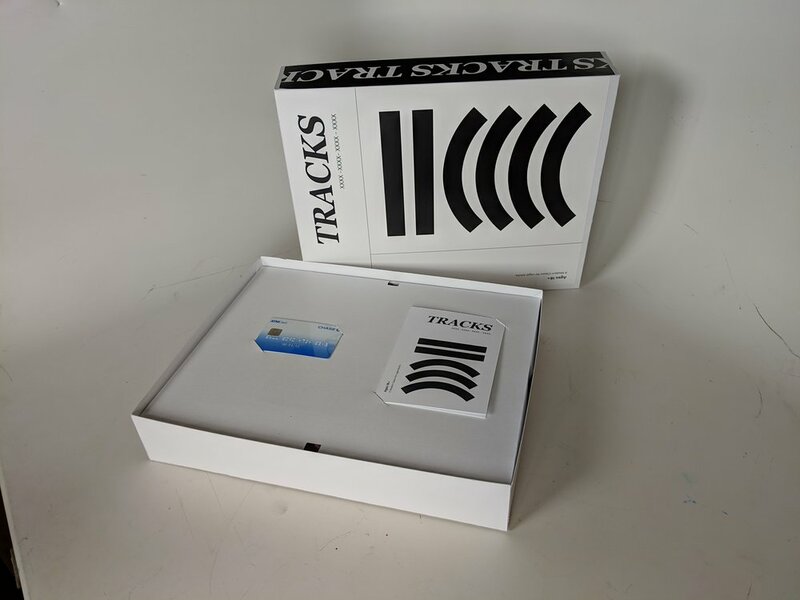 Given more time I would rework the track and maybe design a credit card specifically for the assignment. The Final Fabrication assignment required us to mount a motor. I wasn’t really sure sure what to make for it with limited time this week. I began by trying to come up with a wooden mount to attach to one of the bookends I made for a previous assignment. Luckily another student had 3d printed an extra dc motor mount and let me have it. At this point the plan was to screw the mount into the bookend and attach a small fan to it. At this point I recommend not doing any measuring or drilling at 3am because I messed up more than a few pilot holes trying to get the motor in the right position. After the mount was attached I added the motor and tested the whole thing out. It sputtered a few times and then just wouldn’t turn. Given that it was late and I ran out of other options I kept the motor and just accepted defeat with this. One main positive I learned from the experience was some info about the laser cutter and how to load and 3d print my own motor mounts when need be. 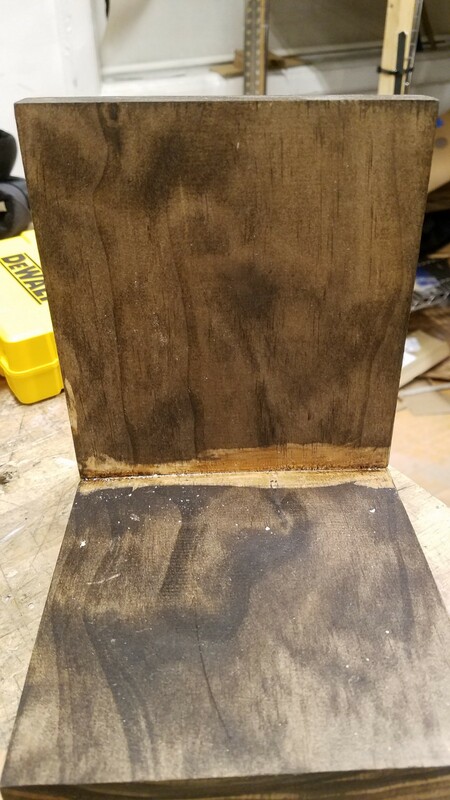 My Fabrication project for this week involved using A 5’’ x 7’’ walnut board and cork. The original idea for the project came from my desire to use cork. My original plan was to create a 3d shape with the cork and then mount it on the wood plate. 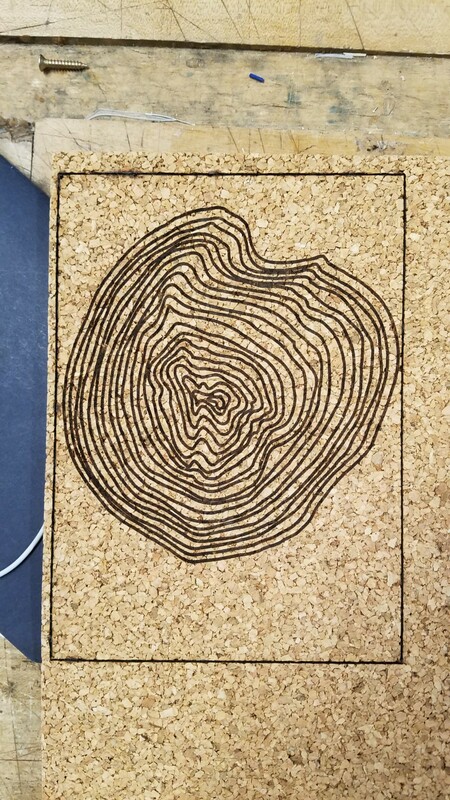 I decided it have a somewhat comedic effect if I made the shape of tree rings using cork. After a few test runs with the laser cutter I went to cut the cork on it. this is the point where I ran into issues. After multiple passes with the laser I couldn’t get the cork to cut at all. 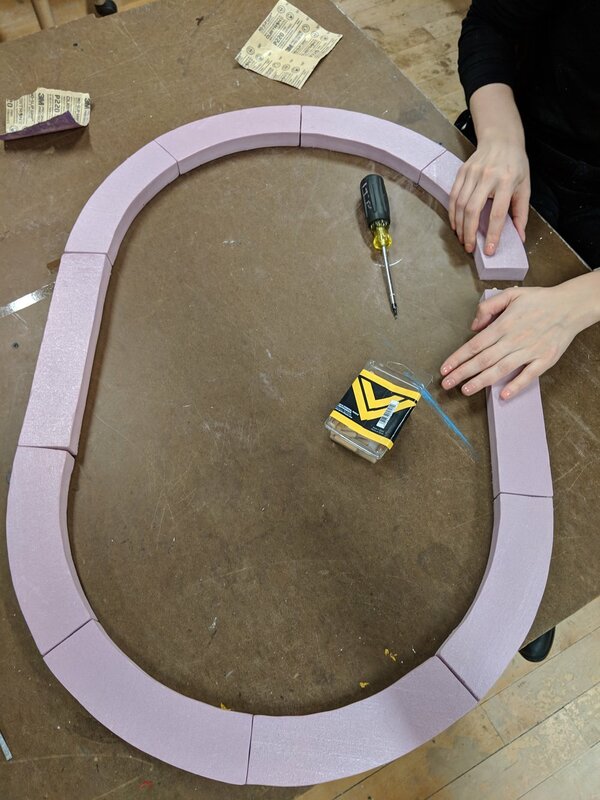 After pulling the piece out I was able to crack out the outline of the largest tree ring but I knew I wouldn’t be able to make anything worthwhile using this method. After this fail I decided to just laser etch the rings and mount the piece on the walnut board. I ended up cutting the edge of the piece out using scissors and then using wood glue to attach the cork to the walnut.